What Does Cold Rolled Steel Mean for Ninja Stars Construction? Before we get into why or why not cold rolled steel is useful or desirable for ninja throwing stars we have to get into the details of cold rolled steel. Please note: I'm not a metallurgist but will do my best to break it down for you. Metal work has been around since the beginning work with iron ore around 2000 B.C.. Steel because of its durability, affordability and availability has been a staple of metal works for a large part of history. And over time, crafters of metalwork have developed different methods of shaping steel that alter the type of finished product it can produce not only from appearance but durability, strength and many other properties. ‘Rolling’ is the process in metalwork whereby metal matter is passed through a number of pairs of rollers to reduce the thickness or introduce uniformity. The earliest advent of rolling metals is attributed to the famous inventor Leonardo Da Vinci. Early rolling mills spawned from what is today Belgium and traveled to England by 1590. By way of the slow and steady industrial revolution years, the earliest designs of rolling mills acquired modern elements. Steel is a key component to most any construction project in present day and as such rolling mills are a staple of modern industrial times. Steel rolling deals with the mass of steels being rolled into a particular form. In the process of rolling steel, there is a choice between hot rolled steel which as the name suggest deals with rolling steel once it has been heated to a high temperature, and cold rolled steel which again as its name suggests, deal with rolling steel that has been left at cold or cooler temperatures. The type of rolling used will vary depending on what the intended purpose of the steel is to be used for. For the hot rolling of steel, the temperatures used in the rolling process are over 1,000 degrees Fahrenheit to heat the steel mass, which is then rolled into the desired shape. If steel is rolled under the hot rolling process, it will have a blue-gray finish and a rough surface. Hot rolled steel undergoes a reconfiguration during the cooling process, because of which the end result is a product that is looser in terms of tolerance, particularly when compared to cold rolled steel or the tolerance of the original material. Because of these characteristics, hot rolled steel is more flexible, and can be molded and bent into a range of varying shapes. Because of this, hot rolled steel is an excellent material for the manufacturing of items such as railroad tracks, beams, metal sheets or anything else that needs the steel to be formed or extruded into different shapes. Cold Rolled Steel on the other hand consists of mass which is rolled at temperatures that are close to normal room temperature. The steel is rolled by using strain hardening methods. 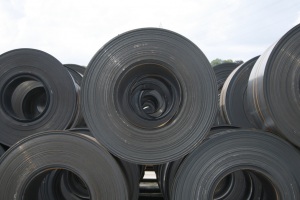 Unlike hot rolled steel, cold rolling produces steel which is very strong, and cannot be bent or forced with ease. Steel that has been rolled in this fashion has a gray finish, and a smooth service, unlike hot rolled steel. Additionally the dimensions of cold rolled steel are much more precise than hot rolling as it is already in its final form. Some of the drawbacks of the cold rolling process is that the amount of shapes or forms of the steel are reduced to round, square or flat and their different variants. This makes working with cold rolled steel more difficult by its very nature. This difficulty in working though is a benefit in that it is much stronger and resilient then hot rolled steel. Because of the different properties of hot and cold rolled steel, it is imperative that the intended use of the steel be weighed with regard to the properties of the steel. If a product need have a larger size and distinct and intricate shaping, it is more useful and efficient to use hot rolled steel, or the hot rolling process. If the finished products need not be large in size, and can be smaller products, but must have a stronger durability and tolerance, such as a throwing star, it would be ideal to use cold rolled steel. When purchasing a throwing star you'll often see a reference to the process used to form the steel. Okay that's not always true, if its not cold formed or rolled steel they usually wont reference that fact as it is not as likely to be as durable as a product. So throwninjastar.com will always call out the metal process of ninja stars reviewed if known, and strongly recommends cold rolled steel for construction unless the throwing star is just a display piece. Discover the Best Throwing Knives: Ultimate Knife Comparison Guide!